Make your makeup flawless with the best tools you can have. 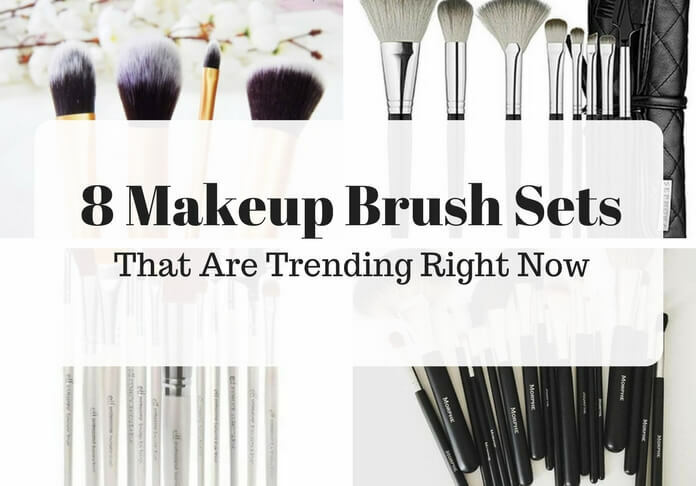 Here’s a round-up of the makeup brush sets that are really popular now, and offer the best value for money. Pick a brush set based on your needs, likes or budget. In the market for a fully-stocked, good-quality brush set? For around $50, you’ll receive 18 professional-quality brushes in a sleek roll-up travel brush case from online cosmetics company Morphe. The set includes everything you need to create a flawless full face, from eyeliner to blending to concealing and applying highlighter. The eyeshadow brushes have the perfect density for flawless application and apply like a dream. They are made of incredibly soft synthetic hair and are perfect for liquid or powder products. If you regularly use a lot of different products, this set is an excellent way to get the most out of your makeup. It’s great value for money— you’ll never have to buy another makeup brush again! YouTube makeup artist duo launched PixiWoo into internet fame in 2010, and the two sisters haven’t looked back since. In 2011, they launched their RealTechniques brush collection, a successful line of hand-cut vegan brushes at an affordable price. Anyone searching for a simple brush collection with a couple of starter brushes should look no further than the Real Techniques Core Collection. This set consists of four essential brushes: a rounded contour brush, a tapered foundation brush, a smaller detailing brush, and a fluffy buffing brush. The four brushes come in a sturdy carrying case which can be propped standing up or packed away in your bag. At just $12 or $3 per brush, it’s super affordable – not to mention good quality and cruelty-free! It’s perfect for beginners and more advanced makeup users alike. If you or someone you know is just starting out with makeup, consider this 12-piece set of brushes from low-cost makeup company e.l.f. This set has the value at only $1.75 per brush. The set contains everything a beginner may need to do brows, foundation, eyeshadow, and more, including an eyeliner brush, a spoolie, a blending brush, a smudging brush, a lip brush, and a bronzer brush. The wide variety of tools allows you to figure out your preferred method of applying makeup without spending a fortune. This brush set is for serious makeup lovers or makeup artists. It’s definitely a splurge, but it works out cheaper than buying each brush individually (their vegan brushes retail to up to $20 each). The Zoeva Makeup Artist Zoe Bag comes with 25 brushes and has been raved about on YouTube and makeup blogs alike. From tapered to angled to rounded brushes of all shapes and sizes, this set has everything you need and more. The pristine white bristles and sleek and stylish handles give these brushes a luxurious feel. The brushes come in a zip-up black leather carrying case with several different compartments. The case holds more than just brushes, too – you can carry around palettes and powder safely without worrying about breaking or damaging them. If you are looking to invest in some quality brushes for your everyday face that will perform well and last wash after wash, keep this 6-piece essential brush set from Royal and Langnickel in mind. This brand has created these 100% vegan brushes for professional makeup artists, so the quality can’t be beaten. The set comes with a fluffy, rounded kabuki brush for buffing and blending powder, a flat kabuki brush for applying liquid or cream foundation, an angled kabuki brush for that perfect contour, bronzer, or blush, a highlighting brush, and a large and small foundation brush for foundations and concealer, all which blend beautifully. These six versatile brushes are synthetic and won’t shed when you wash them. You get what you pay for— high quality and elegant design. You might already have some brushes that you love and are committed to, but they could be just too bulky to take on trips or to visit clients. If you are in the market for a travel brush set that will fit in your suitcase but doesn’t skimp on quality, Sephora’s Tools of the Trade Brush Set has got you covered. Including eight multi-purpose brushes in a soft, roll-up case, these are perfect for anyone on-the-go. It works out to $7.75 per brush for complexion, powder, eyeshadow, brow, blush, and contour makeup application. This five-piece brush set is ideal for the environmentally-conscious makeup lover. The brush handles are made of one of the most sustainable materials available — bamboo – and the bristles are made with synthetic fibers that are hypoallergenic, haven’t been antibacterial treated, and are cruelty-free. Even the packaging is made from eco-friendly and recyclable materials! The set includes a powder blending brush, an angled contour brush, a concealer brush, a tapered eyeshadow blending brush, and an eyeshadow brush, covering all your basic makeup needs. Don’t be put off by the “mineral” in the name – you can use these tools to apply any makeup, liquid or powder. You may have seen Spectrum’s eye-catching brushes on the Instagram accounts of makeup artists and social media influencers alike. All of their brushes are a treat for the eye, in addition to being vegan and cruelty-free. Everything you need to create the perfect smoky eye, cut crease, or whatever eyeshadow look your heart desires is included in the set. You get seven dreamy brushes with rainbow holographic handles and contrasting black and teal bristles. You’ll receive a variety of useful eyeshadow brushes, including angled brushes, fluffy blending brushes and shading brushes of various sizes. You’ll even get a small lip brush for getting that perfect pout. Beauty isn’t the only thing these brushes have to offer – these soft brushes pick up a ton of product, blend like nobody’s business, and won’t fray when you wash them.